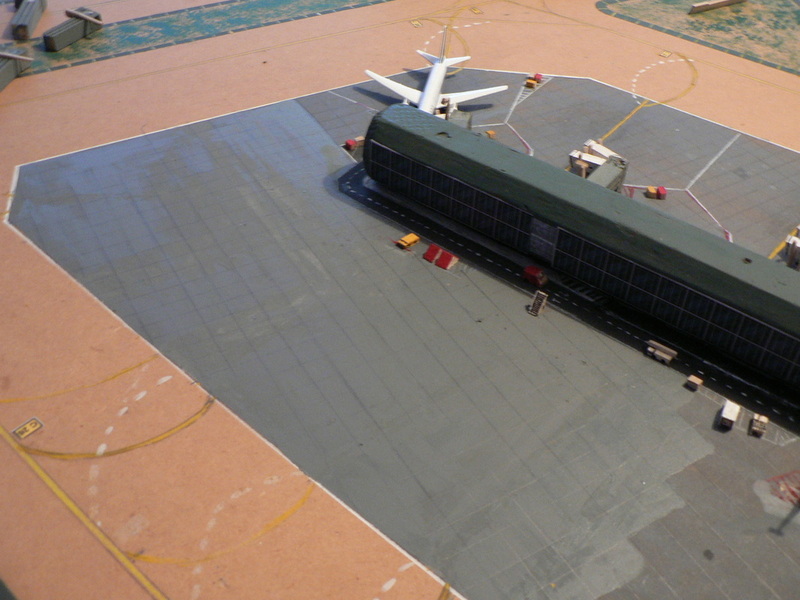 Construction of Imogenia originally began in July 2006 in the garage of our first house in New Zealand using an mdf sheet measuring 7x4ft with a small additional 1x1ft extension. Whilst in the garage the model was sited atop a wooden frame specially constructed for the purpose. 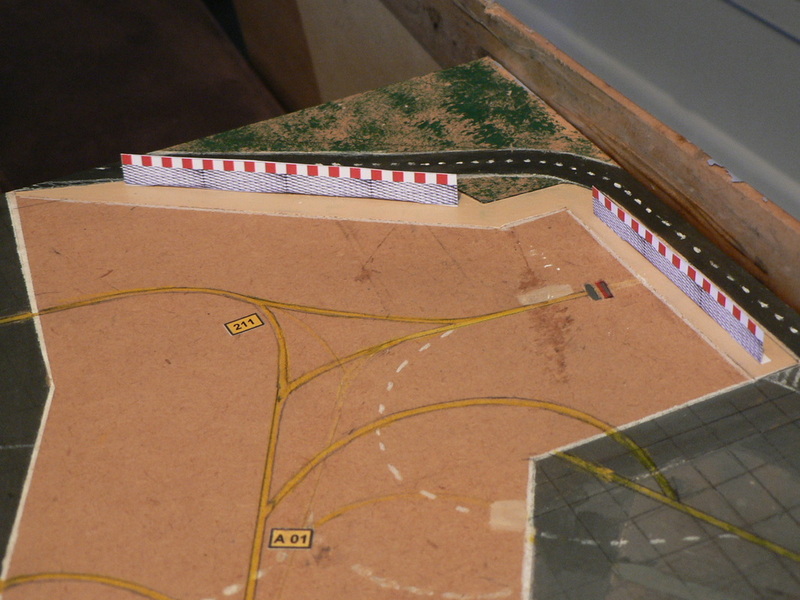 The garage environment was not ideal as it was both damp and leaky and initial construction was quite slow. 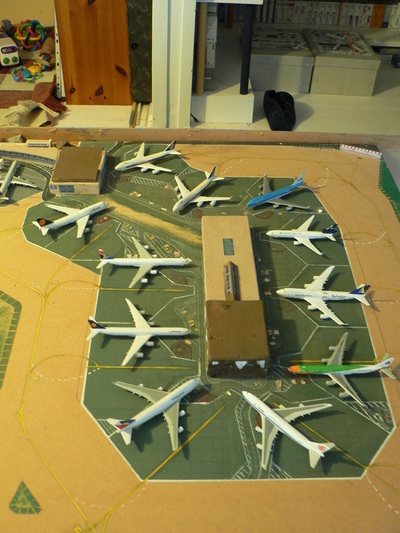 We moved house in November 2007 and that allowed the airport to be moved inside to a far more suitable room. 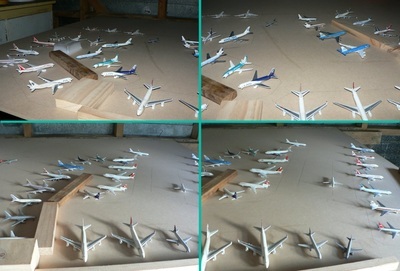 Imogenia continued to be updated into 2010 but my growing collection of 1/400 models eventually necessitated that Imogenia had to go into storage where she remains. 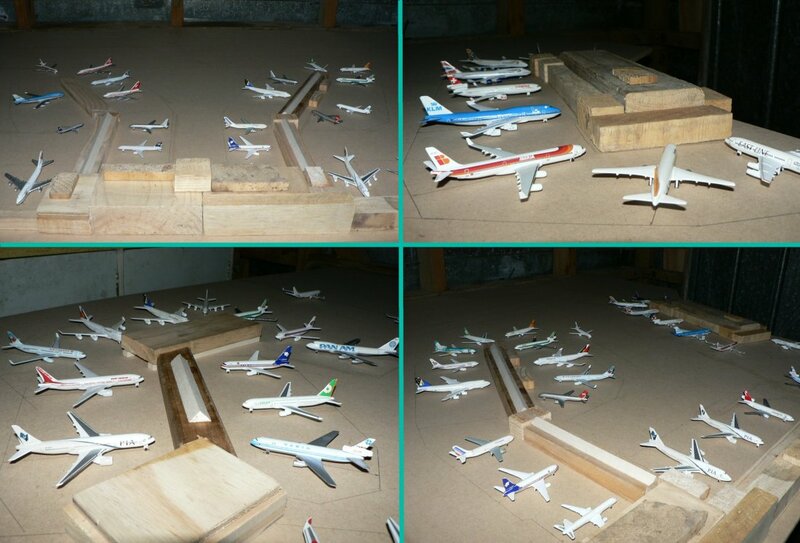 09/07/06: The Beginning: To support the airport I initially constructed a wooden frame in the garage. 09/07/06: Initial Design: I had done some work with different airport layouts before I bought the wood which allowed me very early to have a good idea of the best layout for the model. This meant the first layout was close to the eventual one. The main differences involve the eastern pier (now D) being shorter, with remote parking stands, and terminal 2 being one long pier, which meant the west pier (now A) was shorter. 16/07/06: T2 Redesign: Within a week Terminal 2 and A pier had effectively taken the shape they still have. I had also started to find the wood that I would use for the terminal pieces. 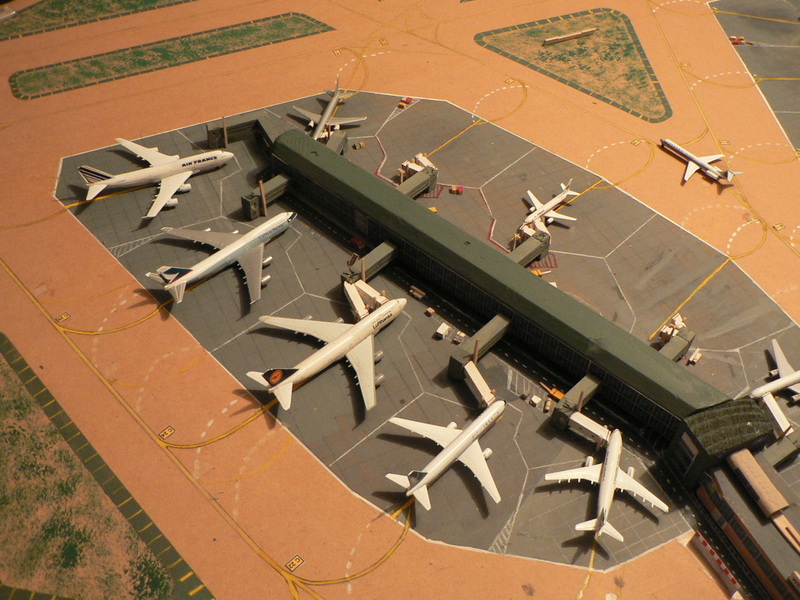 Note how both the main terminal buildings were wooden constructs at this stage. 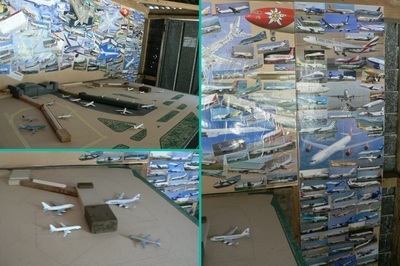 07/01/07: Runway Completed, T1 Built: By this time I had turned the airport around, found T1 (a piece of vacuum formed plastic packaging) and constructed a backdrop of plane pictures to cover the wall. 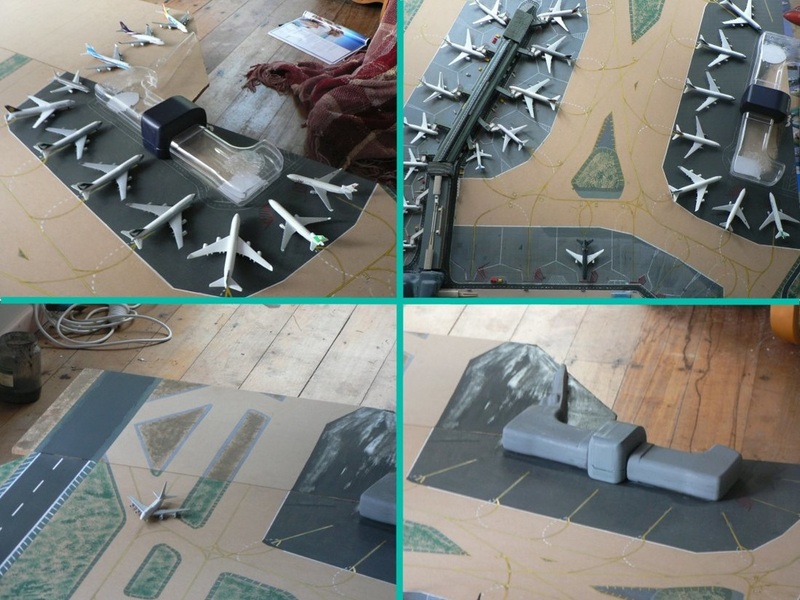 The layout was set and painting was well underway with the runway being complete. 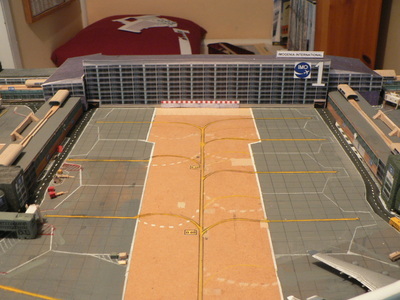 The small extension was removed but would be added again in 2008. 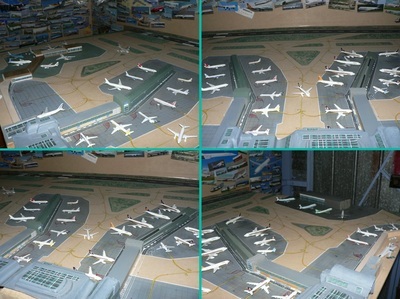 26/05/07: Windows - Julian to the rescue: At this stage most of the painting was complete and I had begun to apply the various windows to the terminals. 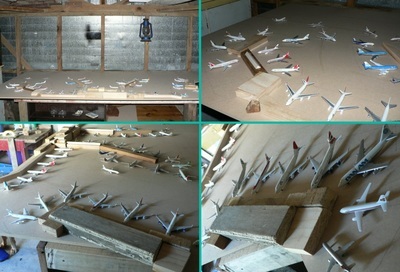 The window designs were provided by Julian Mittnacht and were a massive improvement on my own attempts -thank's Julian! 09/06/07: Taxiway Markings Added: Early June saw the completion of the taxiway markings. 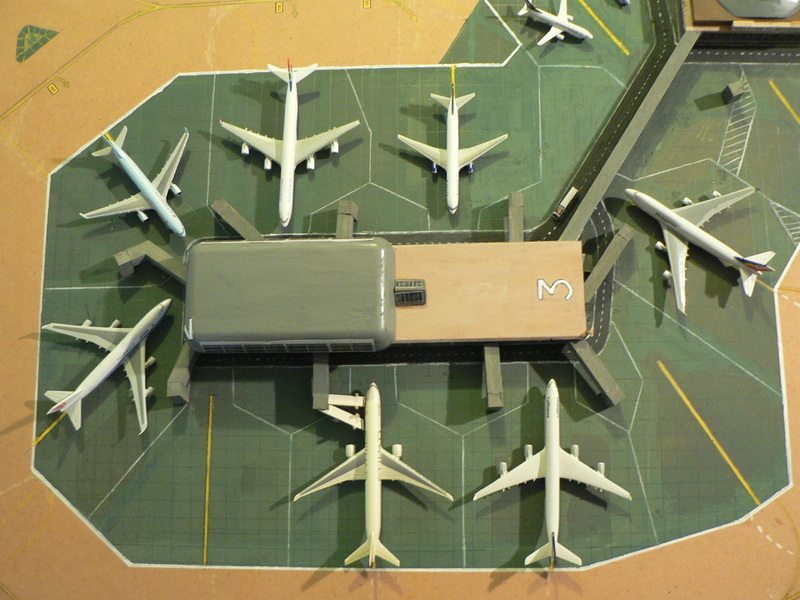 Note how A pier still only has two 747 gates at this date. Later I would expand the apron area and reclaim some grass to allow a third 747 gate. 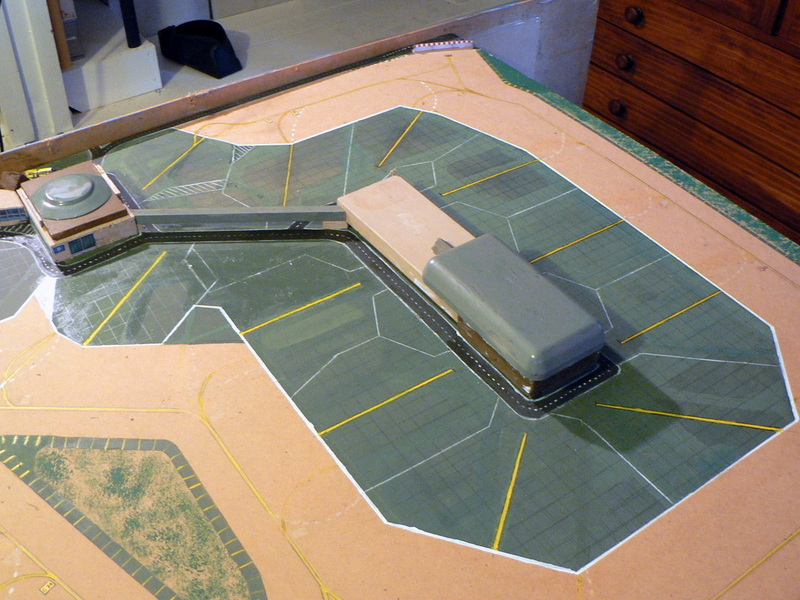 I was also still very undecided about the shape T2 would take. Winter put paid to much more work before the big move in November. 02/12/07: First Airbridges: By december I was able to start adding the first airbridges to D pier. 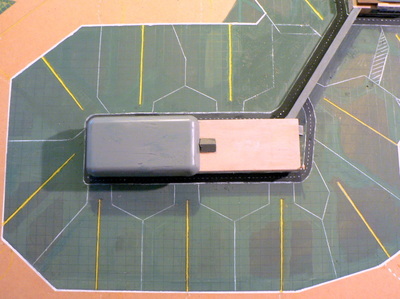 I also began to experiment with and some very simple ground equipment, which was later replaced. 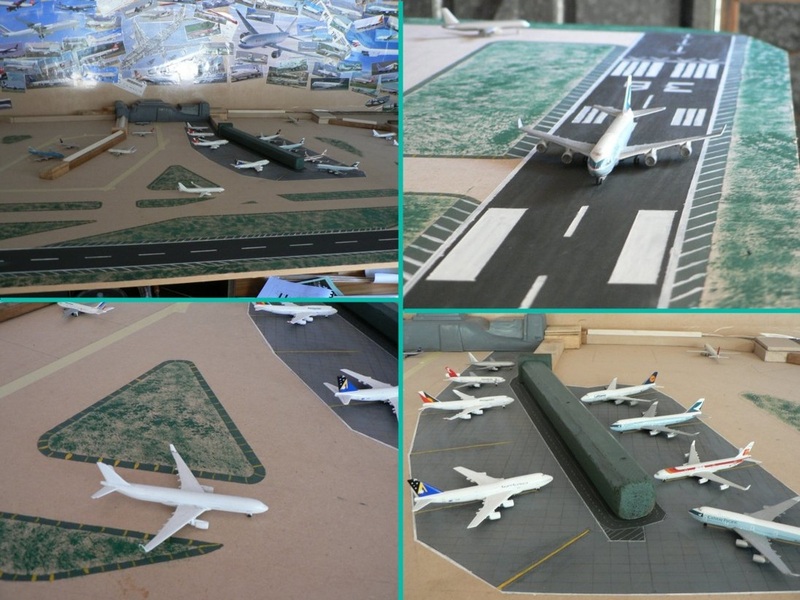 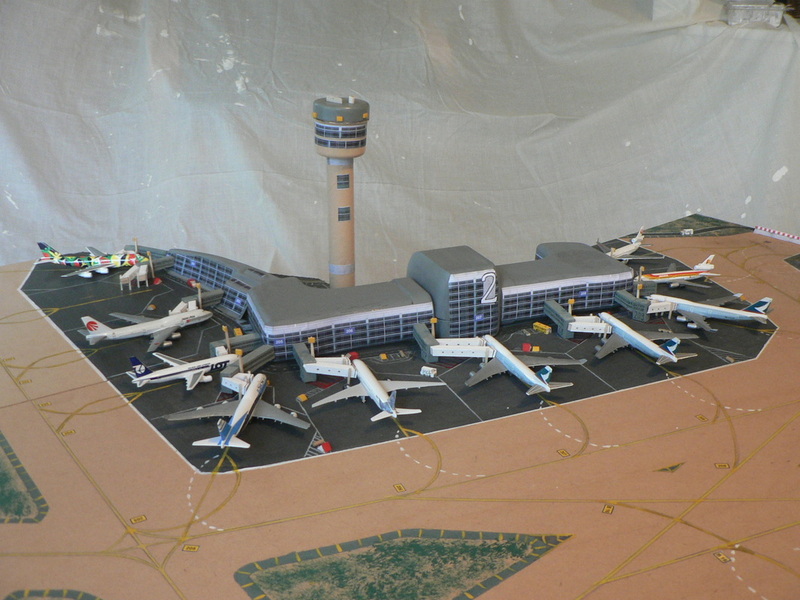 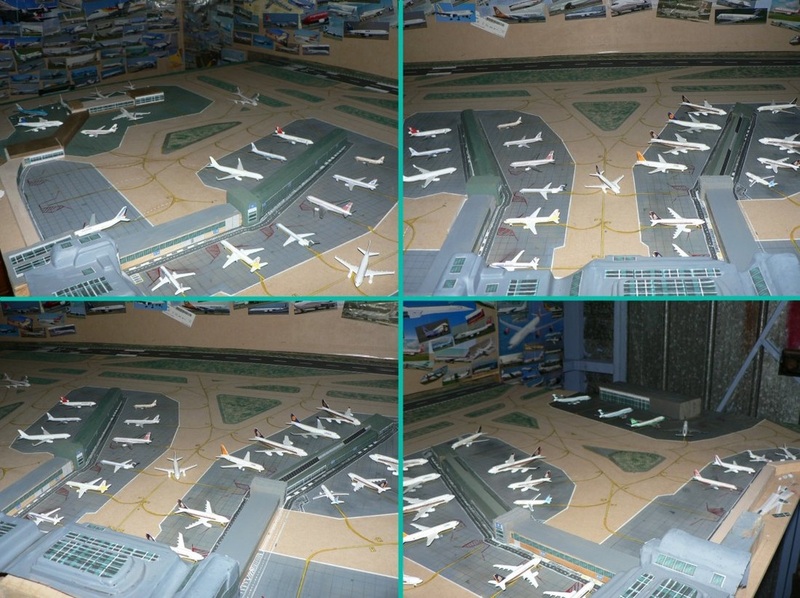 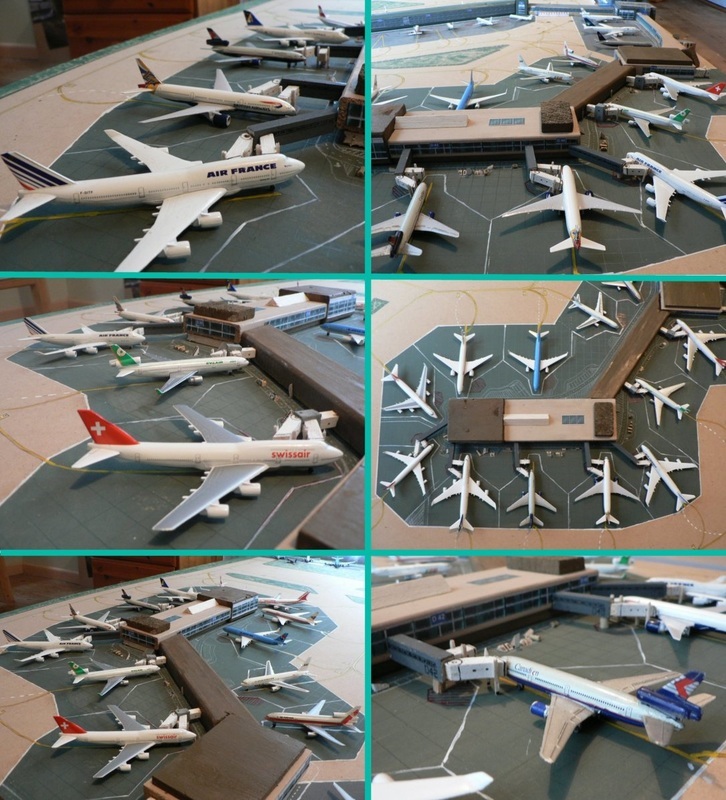 April 2008: Finishing Touches & Terminal Two: Additions included more airbridges, more and better ground equipment, light poles, monorails, better gate markings and more roads. 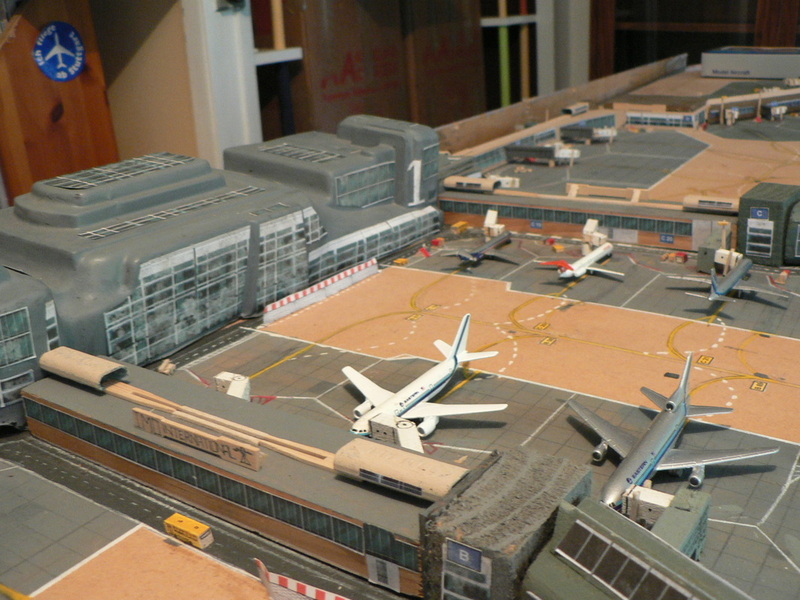 Also I finally found the terminal for T2 in the shape of two plastic chocolate stocking containers, an old watch box and some plastic packaging. 24/05/08: T2 Complete: By the end of May Terminal 2 had been completed including a control tower. April 2010: By early 2010 the old terminal building was looking pretty awful as the airport room was a bit damp and mould had grown on the structure. 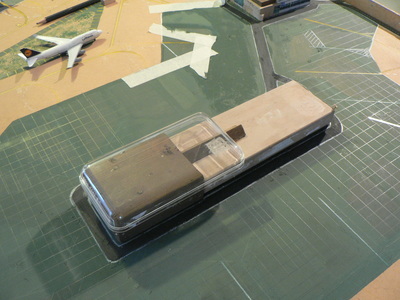 I replaced the old plastic terminal with a new cardboard construction with a more conventional shape and side wings. The gates around Pier C were also remodelled and the airbridges replaced. 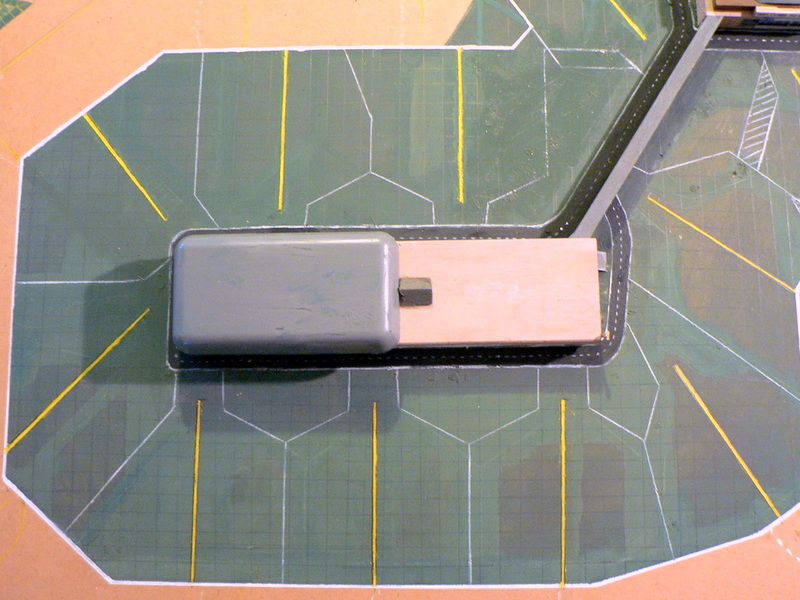 I also added blast fences at the end of the taxiways. 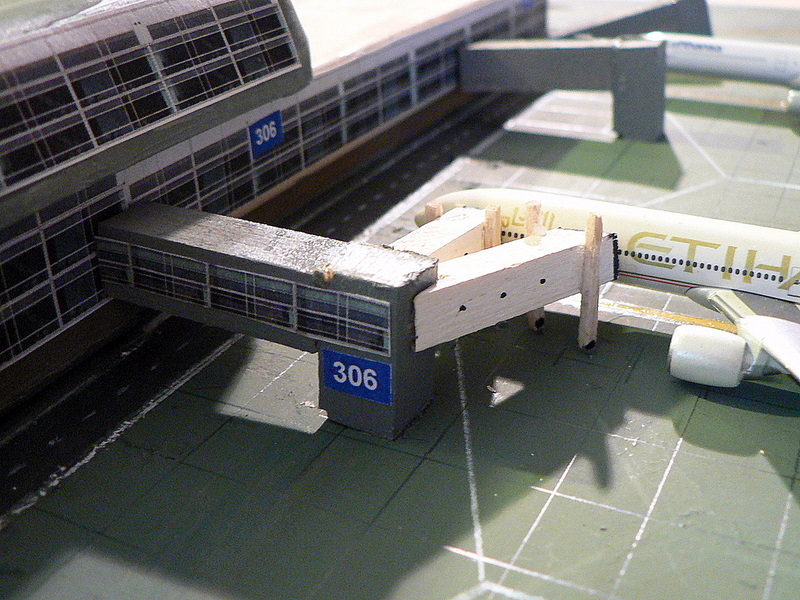 March 2011: The last hurrah for Imogenia was the rebuilding of Pier D into Terminal 3. 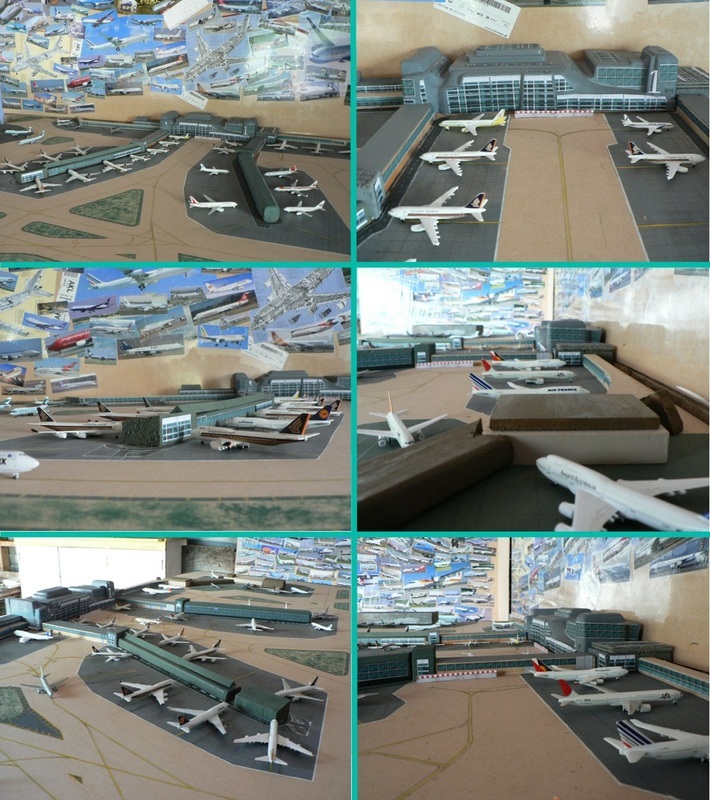 This involved the replacement of the majority of the building and all its airbridges by new construction.